On Friday, Jerry and Debbie welcome Fr. Donald Calloway to the show. You won’t want to miss it. 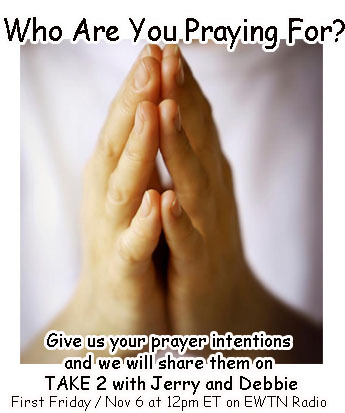 The three of them will discuss the importance of intercessory prayer, and will take your calls and prayer intentions. Call early to make sure you get an open phone line. The show airs at Noon and Midnight ET. I am praying for … My son Anthony that is driving from Albuquerque to California and sucess in his career, for the revert of Jose, Nelson and Jazmin. I am praying fervently and abundantly for a couple that recently lost both of their children in a vehicle accident. This couple has now been left childless and feel totally lost in this sorrow that they have been thrust into. They are not Catholic, but I have been saying rosary prayers for them in hopes the our Mother Mary will help lift them out of this deep hurt and pain they are currently in and lead them to a place where they can put their grieve at the feet of Jesus and find some sort of healing and comfort. My prayers are for all souls who have turn away from our Lord to turn back to him and receive the healing power of his love. My special prayers are for Mothers considering abortion to turn their hearts back to our Heavenly Father; to choose to receive the gift of life he has given them so that they may know the joy of loving and being loved by their babies! Jesus, save and protect the unborn!